Which has happened in this month's issue. Thanks Maha for the scan! at first sight I thought that the photo at the top was of ASIN,the actress. Why dont u try acting mam. Such a lovely interview. And may nature bless you for your hardworking nature with all happiness in this world. I adore you a lot for your different facets in life. Long way to go Ms.Chinmayee. good luck with everything and pretty much a fan of everything you do ..
Good compose. I am still wondering how you are managing many roles.. you are the perfect role model for every one. 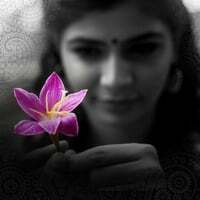 Cute pics chinmayi. The one with sarangi is awesome ..was it taken with mac cam? You mention in an earlier post that you read and loved Eat, Pray, Love. I also read in this article that you are interested in past-life regression. Have you read 'Many Lives, Many Masters' by Brian Weiss. Something tells me you would love it, I certainly did. Reading this article, your mom should be very very happy I suppose. Really Admire you Chin! You are multi-talented. Wish you lot more success in all your career! You deserve it! U look stunning in the first pic.Way to go Ms.Gorgeous!! I liked the interview. Your clarity of thinking and confidence is amazing ! So beautifully the emotions captured!!!! You have achieved so much at this age. Being the same age as you makes me wonder, what have I achieved? haha.... I hope to achieve my goals as soon as possible. Note: when i make my film, ill call you for dubbing. I recently watched the movie "Ye Maya Chesave" and only thing that stood out for me in the movie, was "Samantha's voice". We(Telugu audience) are so used to hear the regular dubbing artist's voice, that your voice was so "refreshing and new". I gotta say, you did an excellent job. 1. Do you know Malayalam/Tamil/Telugu languages? Did you make any adjustments in your voice to bring the Malyalayam Accent into Samatha's voice? Again, lovely job, best of luck. Hi Chinmayi.. Just dropped in to register my appreciation. You look stunning in blue dress and the photo with sarangi is really good. very pretty foto lady! as usual u rock! Just listened to thiruda song,no need for me to say anything bout ur voice,captivating enuf to capture listener's heart,no doubt in that, wish u all the best and wishing to meet you one day if you happen to come to malaysia.. There can't be a better title than this. 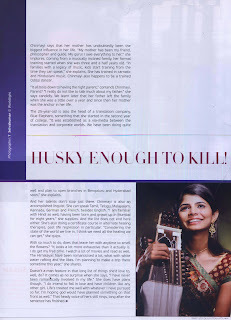 "Husky enough to kill"
You are a neat bundle of excellent talents rolled into one. Your voice is so unique that it keeps lingering in the ears long after the end of the song, which is a divine gift! Keep up the good work. Still have to read the scans. But you looks so good in the stills. Nice one! Your pics r lovely esp the first one! Your r awesome in dubbing, your voice is quite unique n u do it naturally.